Yarrow (Achillea millefolium L.) is a perennial herbaceous plant with hairy leaves with a light aroma of camphor. The flowers are white or pink, with ac acrid taste. It grows mainly in the prairies, but also in the paths of the countryside or on the edge of the railroad tracks. We use flowers and leaves of the plant, for both internal and external use. The yarrow is useful as a digestive inflammatory, or to calm and reduce menstrual pain and hemorrhoids. 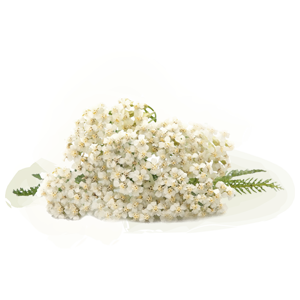 In addition we use the yarrow extract in cosmetic formulas for its excellent dermofunctional qualities; it is used in anti-reddening, toning and astringent products, and it is ideal also for dry, delicate, easily irritable skin and skin suffering from acne and pimples.